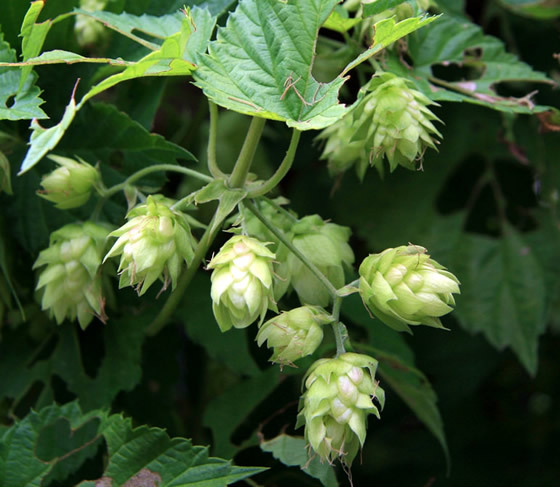 Hops come from the large perennial vine Humulus lupulus. This plant is native to North America and Europe, but is cultivated in many other places. The vine grows to a height of 25 ft (8 m). It has heart-shaped dark green leaves and yellowish green flowers. Each plant produces either male or female flowers. Only the female flowers, called strobiles, are used medicinally. Strobiles are picked in autumn and either used fresh or dried. Hops have been cultivated to be used in the brewing of beer since at least A. D. 1000, but they also have a mixed history of use in healing. Ancient Hebrews used hops to help ward off plague. In North America, several Native American tribes independently discovered the healing properties of hops and used them as a sedative and sleep aid, to relieve toothache, and to improve digestion. By the end of the 1800s, hops were being routinely used in mainstream medicine in the United States as a sedative and digestive tonic. 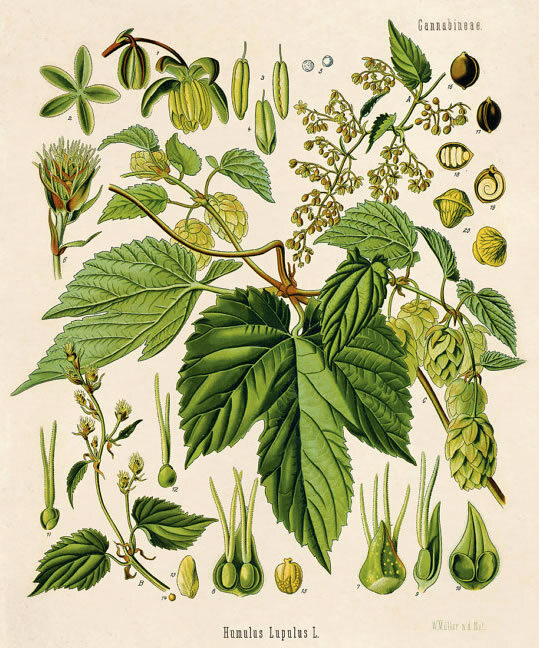 Although hops were sometimes used as a sleep aid in Europe, until relatively recently their major use in Europe was in the brewing of beer, to which they add a bitter flavor and act as a preservative. Today European herbalists are much more enthusiastic about the healing properties of hops. They are used in three ways: as a sedative, to aid digestion, and as an antibiotic. Hops’ best known medicinal function is as a mild sedative and sleep aid. For centuries pillows filled with hops have been prescribed for people who have difficulty falling asleep. Hops extracts taken orally are also said to promote sleep. Hops are chemically complex and contain many different compounds. Scientists have separated out several components that are sedative in nature, although it is not clear whether hops contain enough of these compounds to actually make a person sleepy. Studies are ongoing, but the German Federal Health Agency’s Commission E, established in 1978 to independently review and evaluate scientific literature and case studies pertaining to herb and plant medications, has approved hops for sleep problems, restlessness, and anxiety. Hops belongs to the same family of herbs as marijuana, and some people claim it produces a mild, relaxed, euphoric feeling when smoked. There is no scientific evidence for this claim. 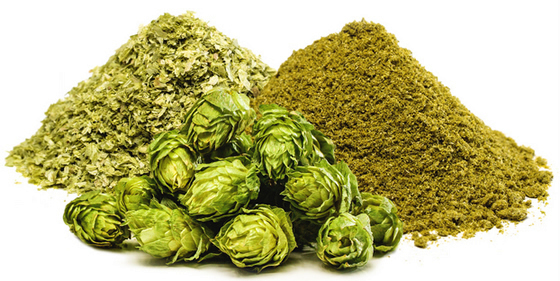 The second major use of hops is as an aid to digestion. It has been used for centuries in both traditional Chinese medicine and Native American healing to stimulate the appetite, ease digestion, and aid in relieving colic. It is believed that hops stimulates the secretions of the stomach. The German E Commission has also concluded that hops may act as a digestive aid. Scientists have isolated another extract from the plant that in the laboratory inhibits spasms in the digestive tract and other smooth muscle. Follow-up studies in people have not yet been done. Chinese healers use hops to treat tuberculosis and as an antibiotic. Test-tube studies show that the bitter acids in hops inhibit the growth of certain bacteria and fungi, including the common bacteria Staphylococcis aureus (responsible for staph infections) and Bacillus subtilis; but do not inhibit Escherichia coli, a bacterium that causes digestive upsets. This antibacterial action may account for the preservative effect of hops in brewed beer. A 1999 study also showed that some compounds isolated from hops were effective in test-tube studies in reducing the proliferation of certain types of human breast and ovarian cancer cells. As of 2002, hops extract is being studied as a possible cancer chemopreventive. There has been much debate in the healing community about whether hops contain a compound related to or easily converted into estrogen, the main female hormone. Some herbalists believe that the presence of an estrogenic compound accounts for the dampening of male sexual arousal and the control of sexual nervous tension ascribed to fresh hops. Other herbalists disagree, maintaining that those effects are related only to the relaxing or sedative properties of hops. In 2002, however, a team of British researchers reported on the activity of a phytoestrogen that was recently discovered in the female flowers of hops plants. The compound, known as 8-prenylnaringenin, appears to be stronger than previously identified phytoestrogens. In addition to their uses in healing, hops are used as an ingredient in perfume and occasionally as a tobacco or food flavoring. Their main food use and commercial value is in beer. Fresh and dried hops have different properties and are used to treat different symptoms. Fresh or newly dried hops, usually dampened with glycerin to reduce the rustling noise, are used in sleep pillows to help ease a restless or anxious person into sleep. As the hops age, they change in chemical composition. For this reason, the hops in pillows should be changed every few months. Fresh hops can also be made into a tea that is taken to combat insomnia. The tea is made by steeping about two teaspoons of fresh hops in one cup (250 ml) of boiling water for five minutes. Dried hops change in composition when exposed to light, heat, or moisture. They should be stored in a container that excludes moisture and light, and should be kept at room temperature. Dried hops are used to treat digestive and other complaints. They can be prepared in a myriad of different ways. As a tincture, about 1/2 tsp (2 ml) can be taken three times a day. Capsules are available commercially to take before meals to aid digestion. Dry extract or powder can be added to boiling water to make a tea. Compresses are made by soaking a pad in the infusion or diluted tincture. An essential oil is produced by steam distillation. Hops are also used in combination with other herbs in commercially available remedies. Hops are not recommended for people suffering from depression. Their sedative action may accentuate depressive symptoms in these people. Some herbalists recommend that pregnant women and those with estrogen sensitive breast cancer avoid hops because of the possibility that they contain an estrogenic compound. Hops are included on the United States Food and Drug Administration’s list of foods “Generally Recognized As Safe” (GRAS). There are no known side effects if hops are used in the recommended dosages. Some people who pick fresh hops may develop a skin rash (contact dermatitis). There has been little scientific study of the interaction of hops and pharmaceuticals. As noted above, however, people who are depressed or who are taking medications for depression should consult a doctor before using hops.